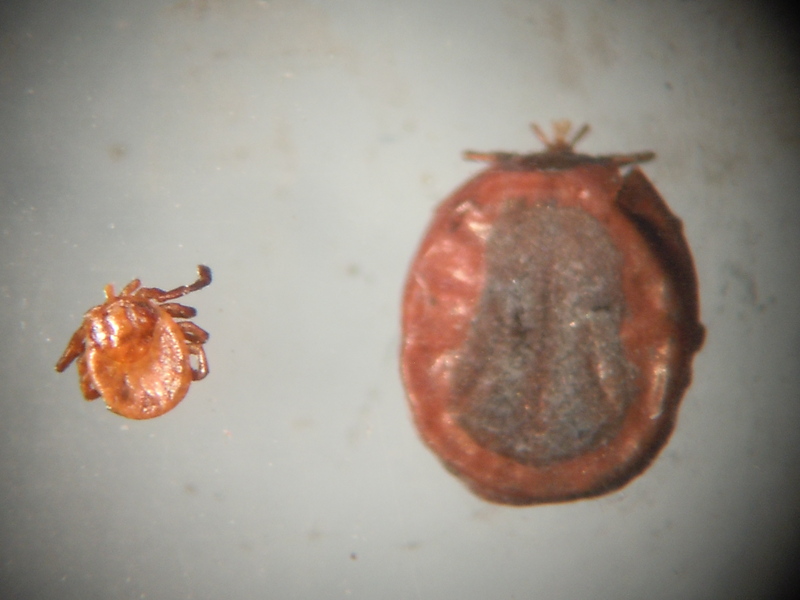 Tick season is in full swing, and CCE’s Horticulture Diagnostic Lab answers questions daily with regard to ticks. 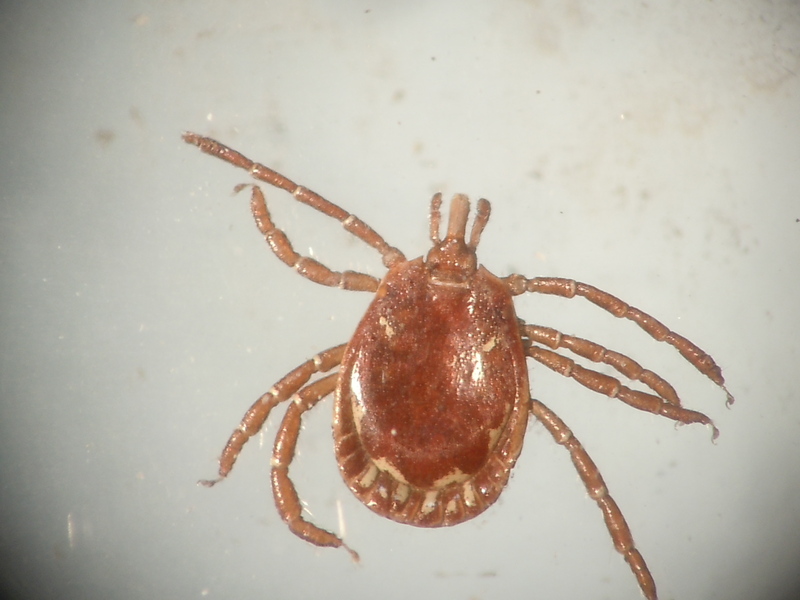 While our lab does not test ticks, we do identify them. Why would this be a valuable service? I will answer this question and dispel many of the myths or fallacies associated with ticks here in this article. Fiction: If a tick is tiny, then it’s a deer tick. Why would I need it identified? 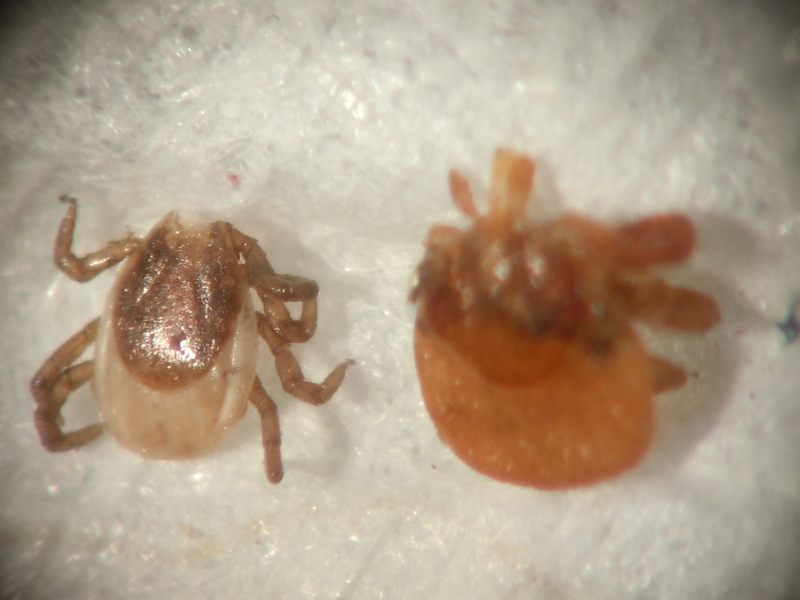 Fact: Deer ticks, also known as blacklegged ticks (Ixodes scapularis) are significantly smaller than American Dog ticks (Dermacentor variabilis), however you should not use size as an identification feature. Lone Star ticks, Amblyomma americanum are also quite small, particularly the immature stage known as the nymph. Note photo 1 which shows a nymph lone star tick with a ball point pen tip, and photo 2, which compares the nymph of the deer tick (on the left, with missing mouthparts) with the nymph of the lone star tick (on the right). Ticks also change in size considerably when they have been feeding. Note photo 3, of a lone star nymph on the left which had only started to feed in comparison to one partially engorged on the right. Fiction: Only lone star ticks have the white spot so without a spot it’s a deer tick. Fact: While it is true that the adult female Lone Star tick does have the conspicuous white spot on the scutum, or shield; the larvae, nymph and adult male Lone Star ticks do not have this spot. See photos 4 and 5 for the comparison of the adult female and the adult male. 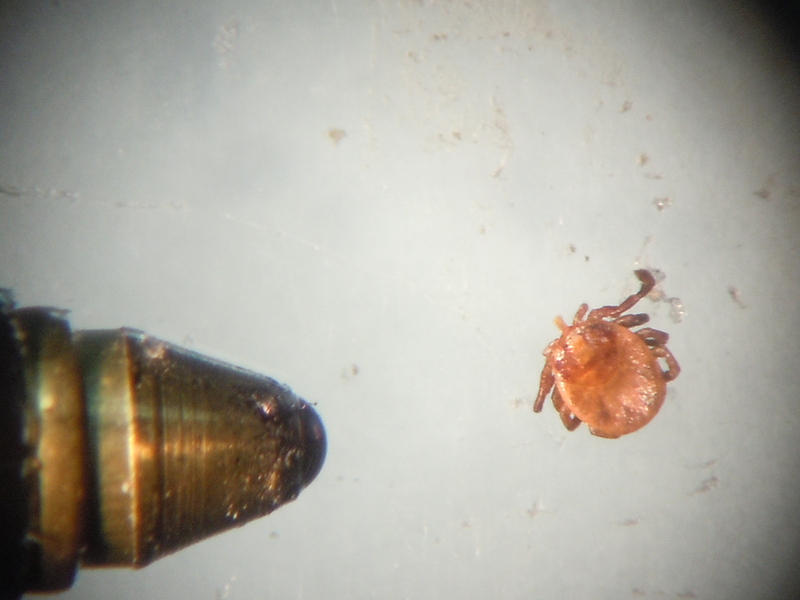 Be sure that if you are using the white spot as a feature to identify the tick that the scutum is clearly visible so that you have the tick oriented correctly and are viewing the dorsal or back of the tick. We often see ticks which are partially or fully engorged have a whitish area in the gut on ventral or belly side of the tick. Fiction: I can prevent ticks by spraying the yard for ticks. Fiction: I pulled the tick out before it burrowed under the skin. Fact: Ticks do not burrow under the skin. They insert their specially designed mouthpart called a hypostome into the skin to feed. This is the only part of the tick that actually breaks the skin. In addition to the hypostome, they inject a cementing agent into the site to help them stay attached while they are feeding. To fully feed, to the point of engorgement, ticks feed for 2-7 days depending on the life stage of the tick (larvae, nymph, or adult). Fiction: My doctor told me to come to the Horticulture Diagnostic Lab and have it tested for Lyme’s. 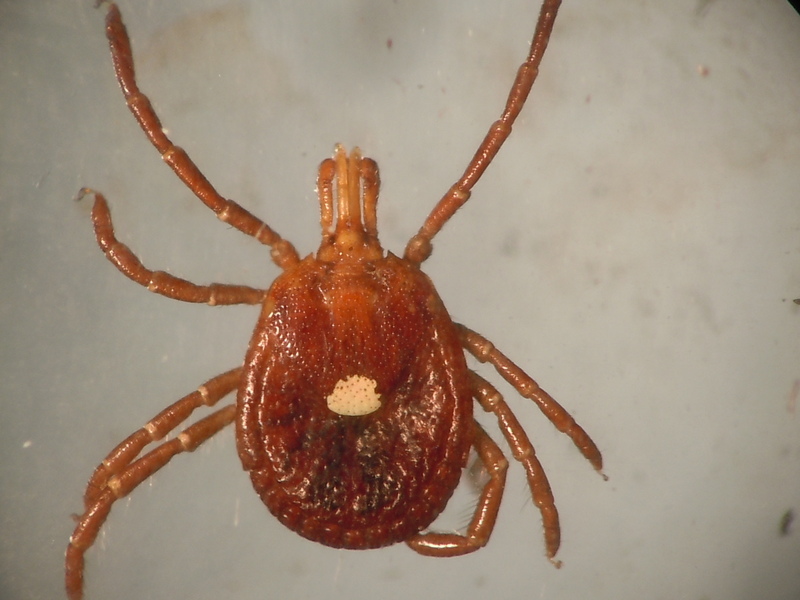 Fact: The Cornell Cooperative Extension Horticulture Diagnostic Lab does not test ticks for any disease pathogen. We can however identify ticks. Different ticks vector for different diseases. For a $11.00 lab fee we can tell you the species of tick, the life stage, if it had been feeding, the condition of the hypostome (which if broken off may still be in the skin and could potentially cause local infection), and will provide you information regarding what sort of diseases your particular tick could carry, symptoms of the various diseases, and general timeframe as to when symptoms would occur following a tick bite. Fiction: The best way to remove a tick is to apply hand soap, Vaseline, nail polish remover or rubbing alcohol to the tick and then it will come off. Fact: According to the New York State Department of Health, the best way to remove a tick is to grasp the tick near the mouth parts as close to the skin as possible from the side with a good pair of tweezers, and pull the tick in a steady upward motion away from the skin, and it should release. Applying anything to the tick that may irritate it to help it “let go” should be avoided as this can cause the tick to regurgitate its gut contents into your skin thereby increasing your chances of contracting a disease. Fiction: The tick I had on my scalp must have fallen out of the trees in the woods. Fact: Ticks found higher up on your body such as your scalp most likely crawled up there from your ankles or lower legs. Ticks are found in grasses and low growing vegetation so walking through these areas is how ticks are acquired. Most ticks are on vegetation no more than 1-2’ off the ground. If you have long hair it should be put up before yard work or gardening in areas where ticks are likely so that hair to ground contact does not occur. Fiction: The tick I had was not a deer tick so that means I’m safe. Fiction: If I use a DEET repellent I should be protected from ticks. Fact: While DEET repellents offer some protection from ticks, if you are going to be in wooded areas for extended periods of time you may have better success treating your skin with repellents of 30% or less DEET active ingredient, and applying permethrin type repellents to clothing or gear only. Permethrin is effective for two weeks or more if the clothing is not washed. As with all pesticides read all label directions before using. Tick repellents are not fool proof. The best way to be protected from tick bites is to check your lower body parts often when you are outdoors and do the “geek” thing; tuck your pant legs into your sock to make it more difficult for ticks to find your skin. Now that you’ve learned a few things about ticks, pass the information along to friends, neighbors, family and doctors. Ticks are a part of our lives here on Long Island so remember to check yourselves after you’ve been in their territory. Ticks do not have to be the end of enjoying the great outdoors! This entry was posted in Uncategorized on July 25, 2017 by dmc72. 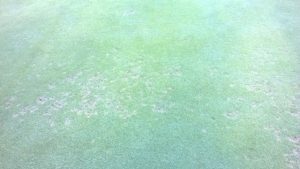 Our Horticulture Consultants in the Diagnostic Lab are seeing common turfgrass problems that occur this time of year, Dollar Spot (Sclerotinia homoeocarpa) and Brown Patch (Rhizoctonia spp.). If you suspect your lawn may have one of these diseases, there are cultural control practices you can use to manage the problem. Dollar Spot is indicative of the dead straw-colored spots about the size of a silver dollar and may persist from early summer until early fall. Its incidence seems to be higher in seasons with low rainfall and occurs on bluegrasses, bentgrasses, fescues, and zoysia. Symptoms depend largely on mowing practices. Under close mowing conditions the circular straw-colored spots are distinctly outlined in the early stages of disease development. 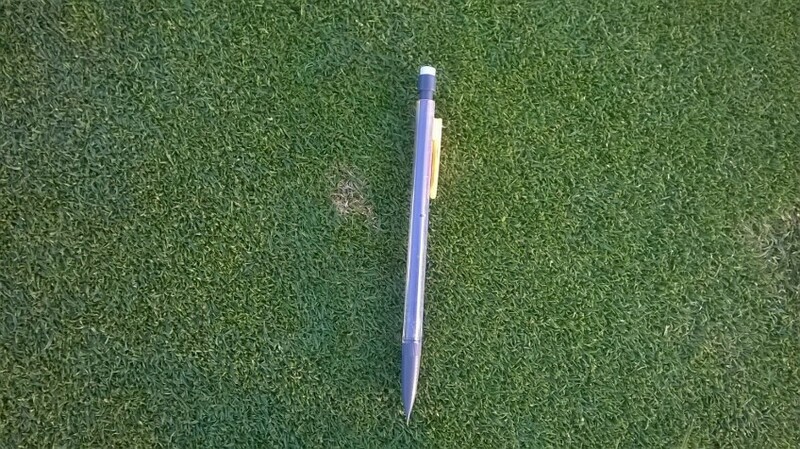 With higher cutting heights, the bleached turf spots are irregularly shaped. In the early morning when dew is still on the grass, a white cobwebby growth of the fungus may be seen over the spot. To manage, mow grasses at the recommended maximum height. Try not to remove more than 1/3 of the leaf surface in any one mowing. Maintain adequate soil moisture, but avoid sprinkling in the late afternoon or evening, and do not overwater. The patterns of symptoms for Brown Patch depends largely on cool vs. warm season grasses, mowing practices and moisture levels. On cool season grasses the symptoms produced by a Rhizoctonia sp. infection may vary depending on the maintenance practices. Under close mowing conditions, cool season grasses that are kept very wet produce small, blighted patches that appear quickly during optimum conditions. The patches may contain a purplish-gray border that is referred to as a “smoke-ring”. Cool season grasses that are cut high and kept dry may produce patches up to 30 cm in diameter. 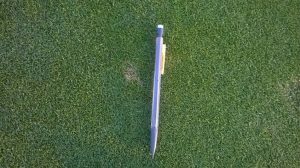 Cultural control recommendations include reducing thatch, removing dew from the leaf blades and providing good drainage conditions. Additionally, fertilizer applications should be monitored to ensure nitrogen levels are adequate but not excessive. Excessive nitrogen can increase disease occurrence and severity. Photos courtesy of Tamson Yeh, Pest Management/ Turf Specialist, CCE Suffolk County. Article adapted from Cornell Cooperative Extension of Suffolk County Horticulture Diagnostic Lab fact sheets Dollar Spot on Turfgrass and Brown Patch on Turfgrass. This entry was posted in Uncategorized on July 20, 2017 by dmc72. 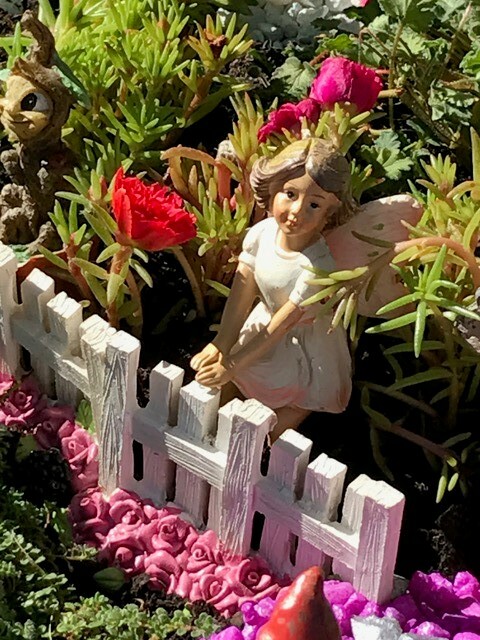 With over two hundred certified CCE Suffolk Master Gardener Volunteers and new trainees participating in various garden projects and horticultural outreach, here is the first of many Volunteer projects to be featured in our blog in the coming months. Their dedication in keeping Suffolk County green and beautiful is demonstrated through the time and expertise they generously donate to Cooperative Extension and our communities. The Master Gardener Volunteers have been busy preparing and maintaining the Children’s Garden at the Suffolk County Farm for our Summer Children’s Gardening program. 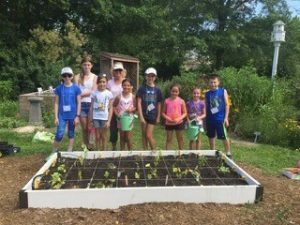 This year’s program is well underway, and is a fun, hands-on program where children can enjoy gardening activities while learning about the natural world around them. 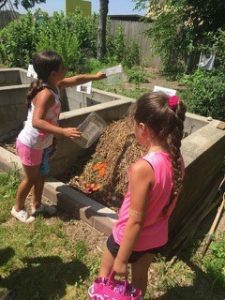 Today, children learned all about seeds and square-foot gardening, and in the coming weeks will learn about growing flowers, vegetables and herbs, composting, weeds, insect pollinators, and how to save seeds. All are welcome to stop by and stroll through the Children’s Garden when the Suffolk County Farm is open to the public. While you are there, check out my favorite, the newly installed whimsical “Fairy Farm” pictured below. For more information about the Children’s Garden, or for resources on youth and school gardening, contact Donna Alese Cooke at dalesecooke@cornell.edu. This entry was posted in Uncategorized on July 12, 2017 by dmc72. Let’s all give a warm welcome to Donna Alese Cooke, the new Community Horticulture Specialist at Cornell Cooperative Extension of Suffolk County. 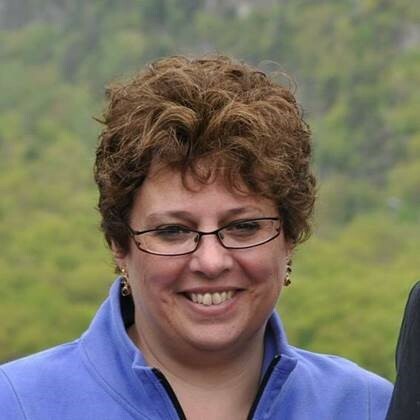 No stranger to Cornell Cooperative Extension, Donna comes to us with experience in education and extension having worked with Master Gardener programs in both Orange and Rockland Counties, and is a Master Gardener herself. Donna is a graduate of the Ornamental Horticulture Program at Farmingdale State College and has a graduate degree in Curriculum Development and Instructional Technology. Donna jumped right in to the busy summer activities on June 19. You can find Donna at 631-727-7850 x225 or DAleseCooke@cornell.edu. This entry was posted in Master Gardener Volunteers, Uncategorized on July 7, 2017 by njc23@cornell.edu.